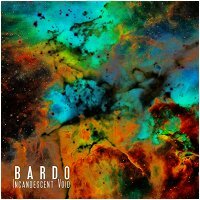 At long last, Kyle Pattrick, the ambient maestro behind Incandescent Void, returns to Earth Mantra with a supremely enigmatic dark ambient release called Bardo. The title is taken from a Tibetan word that can be approximately translated as "in-between", a transitional state between modes of embodiment. In Bardo, Kyle has interpreted this metaphysical concept as "... a passing awareness, in a sea of stars, amongst a backdrop of negative space. It is a passing state of disembodiment before positive experience". But there is nothing in-between about this album. As is typical for Kyle, he commits wholly to his music and never looks back. There is no ambiguity about the form that he embraces, nor is there any apology for its intensity, nor any concession to approachability, nor any hesitation to its direct ferocity. This is deep, inky, pitch-black, colossally dark ambient music that challenges the listener to sit straight up and absorb the immense waves of sound energy that Kyle is channeling. The listener is left breathless, with the impression that a particularly profound experience has occurred, an unfathomable journey through mysterious netherworlds, as if the listener has awakened from a distinctly poignant and lucid dream but cannot remember exactly what it was all about. Bardo is all about that space, the place somewhere in between wakefulness and sleep, somewhere between light and dark, somewhere between embodiment and disembodiment, where all the complexity and wonder and terror and joy can be found, all mixed together. As one would expect with dark ambience, there is plenty of abstraction, huge pillows of cryptic atonality, magnificent beds of roaring sound sculptures, but punctuated with strangely beautiful periods of calm amidst the storm. Like his previous Earth Mantra release, Aether et Umbra, Kyle demonstrates his remarkable ability to fuse complex compositional structures without hardly a single identifiable tone or instrument appearing anywhere. Extraordinarily compelling work.